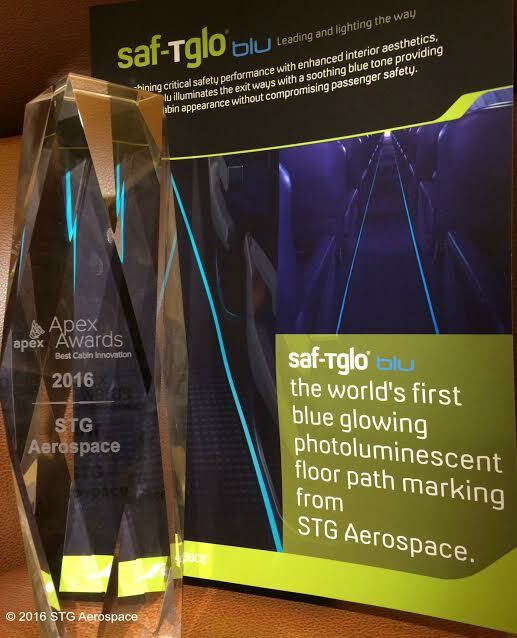 STG Aerospace is delighted to announce that its latest saf-Tglo® blu photoluminescent floorpath marking system has won the prestigious APEX Award for Best Cabin Innovation at the 2016 APEX Awards ceremony. The ceremony was held during the APEX EXPO 2016 at the Marina Bay Sands in Singapore on 24th October 2016 and was judged by a panel of industry peers including APEX members from airlines, hardware and software companies, distributors, aircraft manufacturers and media. The APEX EXPO is the premier venue for airlines and vendors to showcase new products and innovations that will improve the airline cabin environment and enhance the air travel experience. saf-Tglo blu® is the world’s first blue glowing photoluminescent floor path marking system, based on the proven technology of the original industry leading saf-Tglo® range. For the first time ever airlines and aircraft cabin designers can introduce an alternative glowing colour within the cabin interior, harmonizing perfectly with the latest LED mood lighting interiors. Whilst obviously a significant visual enhancement, the origins of the product are actually based in science and specifically the results of human perception analysis. These show that the blue wavelengths of emitted light enable enhanced passenger perception of the emergency track with a dark adapted human eye. Having won the prestigious award for Best Cabin Innovation, competing with finalists American Airlines and Virgin Australia, STG Aerospace was also a finalist in the Best Passenger Comfort Innovation category for its new, patented square-light beam LED reading light. The elite list of companies that won APEX awards in other categories includes American Airlines, Air New Zealand, Singapore Airlines, Etihad, Reaktor and Air Canada. Established in 1995, STG Aerospace is a world leader in lighting technologies for commercial and military aircraft interiors. Its products are currently installed in over 10,000 aircraft worldwide representing one third of the world’s passenger fleet. The company’s product range includes: saf-Tglo®, the pioneering and market-leading photoluminescent emergency floor path system;saf-Tsign®, the leading brand of photoluminescent emergency and informational signage developed for commercial and military fixed-wing and rotary aircraft; liTeMood®, a plug-and-play programmable blue/white LED Mood Lighting system designed specifically to retrofit commercial aircraft cabins. STG Aerospace is a supplier for Boeing, Embraer, BAE Systems, Fokker and Saab among many other aircraft manufacturers and can also count hundreds of airlines, lessors and MROs among its customers. Privately-owned, STG Aerospace has its Headquarters and UK manufacturing facilities in Norwich, an engineering office in Wales, and an office with further manufacturing facilities in Miami serving the US market. In April 2015, STG Aerospace established an official presence in China with the launch of a Wholly Foreign Owned Enterprise (WFOE), STG Aerospace (China) Co., Ltd. based in Shanghai.